By W. Burkart. Brünn [Brno]: Eigenthum, Druck und Verlag von W. Burkart's Buchdruckerei, 1880[-1882]. 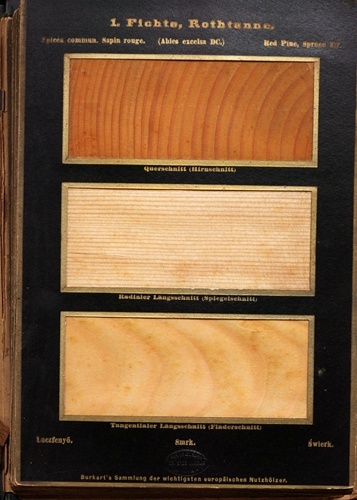 Burkart's Sammlung contains a brief text on European species of trees, including pines, firs, yews, oaks, willows, fruit woods, and others, but its glory is the 40 plates  one per species  consisting of actual wood samples in thin transverse, radial, and tangential cross-sections, held between layers of stiff-card boards with cut-outs so that one can see the wood grain when held up to the light. It is extremely scarce, with only 3 copies in U.S. libraries.